I brought home the unsweetened vanilla. 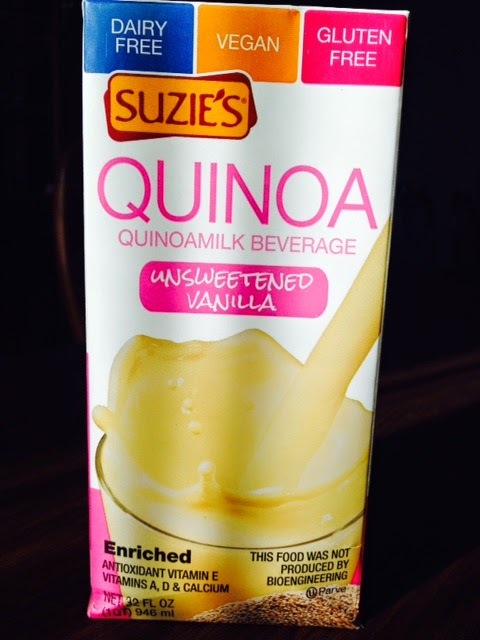 I always try to buy milk with no added sweeteners, and I know that quinoa has a rather prominent flavor, so I thought the vanilla might be a good way to ease into it. 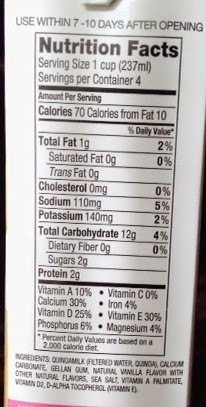 Nutritionally, it has less protein that I would expect with only 2g per serving. Even without added sugar or sweetener it has 2g of sugars per serving! (My other non-dairy milks have 0.) It carries a healthy amount of calcium (30%), vitamin D (25%), and vitamin E (30%), with trace amounts of a handful of other important minerals. Upon pouring a glass, the color is decidedly not white, more of a gray tan. I chilled mine prior to sampling. The mouth feel was similar to rice milk, thin and lacking in body. The vanilla flavor was very prominent on the front end, with a slightly bitter note following. All of my taste testers noted a slightly unpleasant aftertaste. Overall my family agrees that this is not offensive in any way, but not a milk they would not chose to drink plain. My conclusion: I won't go out of my way to buy this milk. It might be a nice way to expand the variety in the house on occasion, but it does not carry significant nutritional load, flavor, or body that would make it a must have. I think that I shall use the remainder of this carton for baking. Have you tried Flax milk, it is delicious!